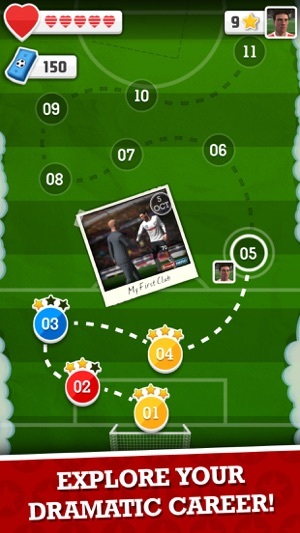 • Game Center achievements & leaderboards to see who ranks on top! • Sync progress between devices with iCloud! * This game is free to play, but additional content and in-game items may be purchased for real money. To disable In App Purchases, go to Settings/General/Restrictions. Thanks for your support everyone, look out for more updates coming soon! Always wanted to be a soccer star? Score! 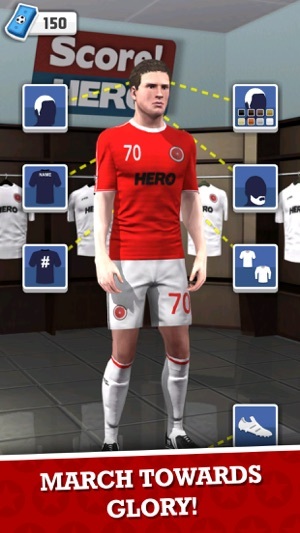 Hero puts you in the kit of a young upstart, making your way to bigger and better clubs. The controls couldn’t be simpler—simply draw a line where you want the ball to go, and let the action unfold. While the gameplay is easy to learn, Score! 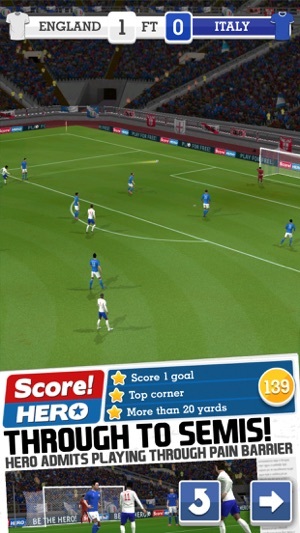 Hero also shines with depth, rewarding thoughtful passes and smart shots over wild swiping. I remember about 3 years ago I used to play this game and I ended up in level 394, I stayed in this level for 2.5 years (I needed to score 5 goals) and I'm not even slightly exaggerating. Of course, I quit the game due to how stupidly hard the level is. One week ago, I started playing the game again - I don't know why... But anyway I remembered how fun this game was UNTIL I ran out of hearts... Seriously... I remembered how it was SO annoying to stay 15 minutes just to get 4 more tries (1 heart); that get used in a blink of an eye. It's so easy to lose a heart relative to gaining one. I stayed in level 394 till yesterday when I finally beat it... 💔 The main problems are that the game is: Stupidly hard in later levels; Hearts get used up unbelievably quick; It takes so long to get your hearts up (1.25 hours) - and you use them in less than 2 minutes 😂😂; The $2.99 offer is just stupid, a better deal would be $4.99 for infinite hearts or at least for 3 months - like a subscription; The keeper's goalkeeping abilities should be a little... more... realistic; Same with the defenders; And what I noticed is that you have to generally get so close with the line you drew to the post/crossbar to have a better chance to score - please alter that slightly. This game has potential; keep adding levels but take the formal points into consideration, till then, my review will still be a 2 star. When I first got this game i thought it was fantastic, and then over time I realized the amount of bs in this game. It’s almost as bad a dark souls in the amount of bs in that game. Like u will draw a straight line to ur teammate and some defender will just come and head it away while my attacker will just stay there and not do anything and u just end up losing. 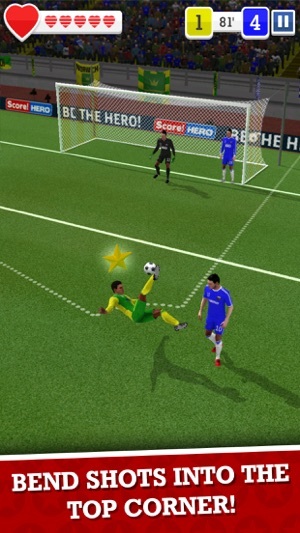 The goalkeeper are like literal gods as they dive from one side of the goal to the other and u again just end up losing to a bs function of the gameThis brings me to my next point, whenever u lose u have to start from the beginning of the game, so u could have just scored 3 goals but if u give away the ball in the 4th goal, u have to start from the beginning. And then the objectives are sometimes so hard to pull off that it’s almost impossible. Everything is very overpriced in the shop and the game is heavily based upon on micro transactions. Like I have to pay $3 just so I can play the game without waiting? It doesn’t make sense. U get like 20 or so heart lives and i spent all of them on ONE ENCOUNTER. Not one mission but one goal. 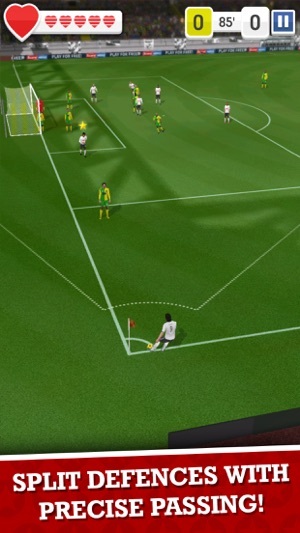 And I still can’t beat it because where ever i shoot or pass the defenders just make some god-like header or something. I could just go on and on, but I have more important things to do, for now I am done with this game and I might come back in the future if they make the game better.